I admit it. I am the granddaughter of garlic-growing, goulash-eating Hungarian grape farmers. As I understand the story, after serving in the Austro-Hungarian cavalry during WWI, my grandfather threw some guy off a Cunard ocean liner in an attempt to escape the country. In those days, you did what you had to do. He entered the United States illegally through Canada, unlike my Hungarian grandmother, who he met some years later. After they married and had children, the INS threatened the poor gravedigger with deportation. He wrote a letter to FDR through a lawyer, pleading for amnesty for the sake of his children. Being a good Democrat, the President let him stay. As soon as I came along, my grandmother taught me to say, “Don’t do that, you naughty boy,” in perfect Hungarian. And she taught me to cook – sour cream being one of the four basic food groups. One of her specialties was stuffed cabbage. Stuffed cabbage, as you may know, can be a pain in the Hungarian derriere. It takes coring and steaming the whole cabbage for the perfect length of time in order to get the leaves just right for rolling. You don’t want them turning puke green. And then you have to pare down the vein of each leaf to make it pliable enough for rolling after adding the meat and rice mixture. And finally, when everyone sits down to eat, what do they do? THEY CUT THE DAMN THINGS INTO LITTLE PIECES!! I always wondered why I went to all the trouble. Thus the reason for inventing stuffed cabbage soup. No time is wasted painstakingly rolling and tucking in those delicate cabbage leaves. The soup starts out in little pieces – the way it ends up in your stomach. Plus, it has far more fiber than the plain rice and meat mixture. 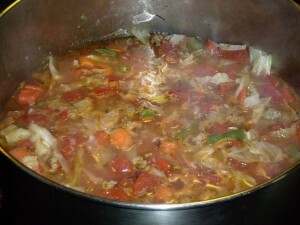 I add carrots, green beans, onions, canned tomatoes, and herbs. Who knows why the Hungarians make stuffed cabbage rolls. Maybe they were an early version of the sack lunch, so kids could take their meat and rice to school before Tupperware was invented.